When I was reviewing the text I noticed that one certain part could have been translated better. "I'm pleased to hear that your nomination was approved and that you have received a vote of confidence by the parliament - I now leave the country in your hands. God bless you." With that PM Bakhtiar kisses the late Shah's hand and the Shah enters the aircraft. Please pass this article on to your friends and family as it contains historical facts which, especially us in the "new generation" or "burnt generation", need to be aware of. 15th January 1979. 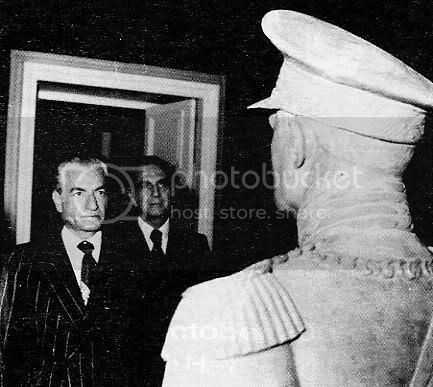 One day before his departure from Tehran, Shah Mohammed Reza Pahlavi stood in front of a statue of Reza Shah I in one of the rooms at the Niavaran Palace and expressed his regrets for deciding to leave Iran and said farewell to his father. Dr Amir Aslan Afshar, Chief of Protocol at the Imperial Court, stands to the right of the Emperor. Translated from the Persian edition of Dr Mostafa Alamouti’s series “Iran During the Pahlavi Era” Vol.15 (1994) by Cyrus Kadivar, 28 November 2003, London, UK. Introduction: Dr Amir Aslan Afshar is among the few knowledgeable Iranian diplomats with a distinguished career as a former ambassador to the United States, Germany, Austria and Mexico. His last role was Protocol Chief at the Imperial Court of Iran. Dr Aslan Afshar served the second Pahlavi during his final months in power and accompanied the emperor on his flight from Iran and remained by his side until the very end. He currently lives between Nice and Vienna. Dr Mostafa Alamouti(MA): You were close to the Shah during those turbulent days. Why did the Shah’s morale weaken so much that in late 1978 he was unable to take any decisions? I still recall the day when the Shah granted an audience to a high level parliamentary delegation. It was clear to me that he no longer had the will to run the nation’s affairs. Dr Amir Aslan Afshar(AAA): Soon after the liberalisation policy was declared His Majesty wished to see his people participate in their national affairs within a constitutional framework. Unfortunately, his internal and external opponents took advantage of the situation and totally paralysed the country. His Majesty soon realised that the scope of the agitation was very great and those who came to see him offered their own set of solutions. None of them were able to calm matters. As things grew worse day by day His Majesty’s morale grew weaker and his opponents exploited the situation and did their utmost to strike against the imperial regime. MA: Don’t you think that the Shah’s flagging morale had something to do with his cancer? Was His Majesty aware of his illness? Were you who met the Shah regularly aware of his cancer? Or did they, as Dr Safavian has said, kept the cancer a secret from the Shah? MA: What was the reason behind the change in the Shah’s decision to appoint General Azhari instead of General Oveissi as prime minister? Who were the people who influenced him? AAA: The American and British ambassadors frequently visited His Majesty for consultations. Since His Majesty considered the disturbances in the country as being political in nature he was naturally seeking a political solution which is why he paid so much attention to their views. In those troubled days, especially during the last days of the Sharif Emami government when I saw how desperate the situation had become, a few of my friends including General Badrei, General Hashemi Nejad, General Khosrowdad, General Moinzadeh, Kambiz Atabai and Jahanbini came to my office. It was early evening. They pleaded with me to tell His Majesty to do something before the country was lost. In front of these gentlemen I threw myself at the Shah’s feet besides his car and said, “Your Majesty, think of something, because this situation can not last like this, the banks and shops are being set on fire, security is non-existent and the people are miserable.” Khosrowdad had tears in his eyes. He said that the demonstrators were insulting his troops in the capital. His Majesty was very moved by what he had heard and told me: “Go and phone Oveissi and tell him to stay at his office because I want to talk to him.” All those present, especially the military, were overjoyed as they assumed that Oveissi would be asked to name his cabinet and restore order. I went and informed Oveissi. Moments later, His Majesty asked me to summon the American and British ambassadors to the Palace. I phoned the U.S. ambassador [William H. Sullivan] and he said that the town was noisy and since the embassy was in the northern part of the town he would still be able to come but since the British embassy had been set on fire, the British ambassador had sought refuge in the French embassy and asked that I should call him there. I rang and he [Sir Anthony Parsons] said that I have no security and I am afraid of coming over. I promised to send him an armoured car belonging to the army and did so. The American and British ambassadors were granted an audience and began their talks. They also met with Her Majesty, the Shahbanou, and exchanged views. Later His Majesty told me that he had decided to ask Azhari to form a cabinet. “And what about Oveissi?” I asked. His Majesty replied: “Call him and say that I don’t need him anymore.” As it transpired, the American and British ambassadors were of the opinion that Oveissi would use violence which would make matters worse and even Her Majesty, Shahbanou Farah, believed that the demonstrators should not be maltreated. As a result His Majesty changed his mind about making Oveissi prime minister and immediately summoned Azhari and asked him to form a cabinet. Later in Morocco when I asked His Majesty why he had changed his mind, he replied that the American and British ambassadors were convinced that Oveissi would advocate tougher measures and that this would only further complicate the situation. It was therefore more sensible to appoint a milder person to quiet down the masses. In my humble opinion all these things were part of a plan and I believe the United States and Britain did not want to calm the situation. MA: After the revolution certain individuals claimed or wrote that during the final days of the late Shah’s rule they visited him regularly to offer him their blunt advice. How true is this? AAA: I have read most of these claims. In my opinion the majority of these stories are not true. These are empty talks in exile. During the final days of His Majesty’s stay in Iran the number of people requesting an audience were very few. One day His Majesty said: “Why are there so few visitors today? What am I to do all day?” For this reason I decided to contact various personalities and invited them to come and meet with His Majesty and many of them I invited by telephoning them. Some of them visited him one or two times but all of them were polite and respectful during their conversations usually offering friendly advice on how to deal with the crisis. I advised His Majesty that in order for the people to be aware of what was happening to their country it would be better if we invited the heads of various guilds, the merchants, and other classes, to Saadabad Palace to talk with His Majesty. He agreed and this was done one or two times. When the people of southern Tehran came and met with His Majesty they expressed their support in an emotional manner. This lifted His Majesty’s spirits. Unfortunately, as the crisis worsened these meetings were abandoned. Those people who have written that they met the Shah many times and spoke to him for long hours are simply exaggerating. MA: Some people believe that a foreign conspiracy led to the collapse of the imperial regime in Iran. What is your view on the role played by foreigners in creating the 1979 crisis? AAA: The truth of the matter is that when His Majesty was fighting to raise the price of oil and leading other OPEC members to do the same the oil companies became very angry with His Majesty and decided to avenge themselves by using their influence in the media. Even the Israelis who enjoyed excellent relations with Iran became worried when they saw how much Arab-Iranian relations had advanced. They were alarmed when relations between Iran and Iraq improved in the aftermath of the Algiers Agreement  and Iran sent troops to Oman to quell the Dhofar rebellion. The Israelis felt that the close relations between Iran and the Arabs was too dangerous. For this reason they decided to change their stance and by using their influence in the world media they began a vicious publicity campaign against Iran and the monarch. The Americans and the British had their own reasons to be unhappy with the Shah and the situation in Iran and supported the agitation. His Majesty told me in Morocco that these [powers] did not want me no matter what I did. One day I suggested to His Majesty that now that the Americans and the Europeans are agitating against Iran it is better that we get closer to the Russians so that they understand that Iran would review its foreign policy, or that His Majesty should visit Brezhnev or that we invite Brezhnev to Iran. His Majesty accepted my proposal and summoned the Russian ambassador. The next day the Russian ambassador was given an audience during which His Majesty reminded him of the friendly relations between Iran and Russia and there was talk of inviting Brezhnev to Iran and His Majesty’s visit to Moscow and the ambassador happily agreed to inform Moscow of the royal decision. The following day the Russian ambassador invited me to dinner and said that he planned to host a reception in honour of the Shahbanou’s mother. It was a private dinner with about 16 guests. After our meal the Russian ambassador made a very lengthy speech about the expanding and friendly relations between Iran and the Soviet Union and hailed the stability and advances made under the leadership of His Majesty. After hearing this speech I was sure that a state visit would soon take place. The Russian ambassador went to Moscow and we never heard from him again and the daily problems did not allow a follow up. When I asked His Majesty in Morocco about the whereabouts of the Russian ambassador and whether he ever gave an answer to our proposal for a state visit, His Majesty replied that the ambassador had left and did not return until after Khomeini seized power and this proved that even the Russians wanted to see a change of regime. What other way could the Russians rid themselves of 40,000 Americans in Iran? How else could they dismantle the listening posts along the Caspian Sea? Then His Majesty added: “Therefore, the best way to achieve their goals was to destroy me.” His Majesty also told me that [before leaving] the British ambassador had told him that if Khomeini entered the United Kingdom he would not require a visa but when he had wanted to go to England they had refused. This proves that the foreign powers were implicated in a plot against Iran. MA: What is your opinion about the BBC broadcasts during that time? 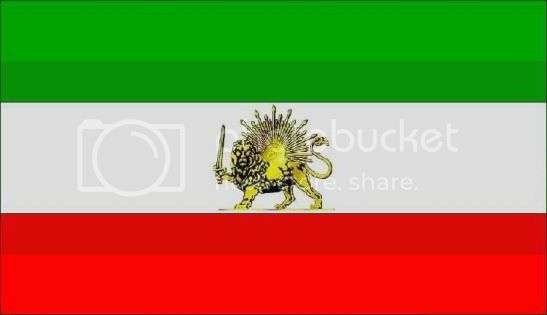 AAA: During his final days in Iran, His Majesty ordered me to summon the British ambassador to my office and tell him that the BBC was causing a sensation. I was to say that although the Imperial Guard possessed the equipment to jam the BBC broadcasts we preferred not to do so and instead request that such programs be halted. The British ambassador came to my office of protocol and I told him the matter. Of course, as always he said that the BBC was not state-controlled but free and that the British government could not interfere in its work. He promised to contact London and report back the outcome. A few days later the ambassador returned to my office and explained that a few nights ago British television had aired a programme ( BBC interview with members of the IRA) and added that these terrorists had agreed to be interviewed on the condition that they wear masks over their faces. During the interview they attacked the British government and stated that they would fight to the bitter end using their weapons and any method to advance their patriotic goals despite being accused of terrorism. The British ambassador said that when British television showed such programmes which went against British interests and ignored the wishes of the government how could we expect that they prevent its radio broadcasts? The BBC he said was free and did not receive orders from any public or private organisation. Later we discovered that after the ambassador’s report was sent to London with our request to halt the BBC’s provocative broadcasts they had staged a fake interview using their own staff who had Irish accents to appear on television so that their ambassador could give a reasonable answer and justify the free nature of the BBC and its independence from the government. Of course, I do not understand why despite what is taking place in Iran these days the BBC has gone quiet. And why did this programme take place two or three days after our request when the conflict between the English and the Irish had been going on for years? MA: When in January 1979 His Majesty was leaving Tehran did he still hope to return to Iran? Or did he think that the monarchy in Iran was about to collapse? MA: His Majesty’s trip to Egypt and Morocco took place with the royal aircraft piloted by Colonel Moezzi who is now the head of the military wing of the Mujaheddin-eh Khalq. How could such a person have gained His Majesty’s trust? MA: In the diaries of Alam I read that His Majesty had called certain people names or used bad words about them which I personally never witnessed nor heard from his close relations. You who were close to HIM did you ever hear him use such [alleged] foul language about people or his intimate circle? MA: What was the situation like outside the country during the period which you spent with His Majesty? AAA: His Majesty was of course very upset by what had happened to Iran. He used to say: “All the achievements of my father and me and the Iranian nation during the past 57 years has gone up in smoke. Iran is experiencing the Great Terror and this will last for a long time. People will later understand what has happened to them but by then it will be too late.” I must admit that His majesty truly loved Iran. Of course, even a lover makes mistakes. One day in Morocco while walking with King Hassan he turned to the Shah and said: “Reza, one of your greatest mistakes was that you loved Iran more than the Iranian people and you wanted Iran to advance too quickly.” His Majesty replied: “I loved both Iran and the Iranian people. Was not everything I did for the farmers, workers, scholarships for students studying abroad, free meals for students in Iran, and other things, for the glory and prosperity of the Iranian nation?” In Morocco I told His Majesty that in our country many things took place which Your Majesty was not informed about. For instance, during the 2,500 years celebrations when I was the Iranian ambassador in the United States I suggested that with the cooperation of the American authorities we try to catalogue all Iranian objects gathered in the US museums. It was a complete project. I prepared a report on the subject among other things and His Majesty liked the idea so much that he asked [Court Minister] Alam to execute it. A meeting was held with Dr Eghbal. The Court Minister said: “I want to thank you in the presence of Dr Eghbal who has allocated One Million Dollars to be sent to you.” I also thanked them and returned to Washington. When I got to America all I received was $100,000 and there was no sign of the remaining $900,000 and the Court Ministry never gave me an explanation. When I told His Majesty this story he said: “Why did you not inform me? It was your fault.” I replied: “On numerous occasions Your Majesty expressed satisfaction regarding my work as ambassador in Austria, USA, Germany and Mexico. Nevertheless, I was certain that if I had complained I would have received a telegram a few months later thanking me for my services and informing me of another posting and ordering me to hand over my office to a member of the embassy staff.” His Majesty laughed and said: “Maybe you are right.” One day, while I was serving as the Iranian ambassador to Washington, I received the CFO of the company that built Phantom jets at the Imperial Iranian Embassy. I asked him why there had been such a long delay in the delivery of the Phantoms? The fellow said that they were trying their best but that they were busy with the Vietnam War and would try to deliver the jets in the near future. He said: “The real reason for my visit is that Mr Mahvi has approached us and has asked to be given the agency for the Phantoms but as you well know the Phantoms are not Cadillacs to require an agency and such a thing is unheard of, which is why I have come for your help?” I replied: “I don’t know, let me ask Tehran.” I sent a coded message to the Court Ministry since I knew His Majesty’s great interest in Phantom jets. From Tehran I received a reply signed by Mr Alam, the Court Minister, that: “I passed on the message. His Majesty wants to know what does this have to do with our past instructions?” The meaning of this telegram was that we were eager to receive the jets and that the rest is not of your business. At the time I thought that Mr Alam had presented the report [to the Shah] in such a way to help Mr Mahvi. One day in Morocco I told this story and His Majesty replied that he was unaware of it and that Alam had never raised the subject. MA: In exile, did His Majesty ever complain of the ingratitude of those closest to him and who did he name? What were his feelings about his childhood friend [General] Fardoust? AAA: His Majesty often complained about Behbahanian. During the final days when I was with him at the hospital in Cairo he said: “He [Behbahanian] treated us very badly.” About Fardoust he did not want to believe that he could have been so disloyal. As for Hossein Sadegh and Khosravi who had been serving at the Rome Embassy between 19-22 August  and who had proved their loyalty in those days, he asked: “Why are they not here? They have not even telephoned once or written a letter.” I said: “Regarding these matters perhaps you have been misinformed. Your Majesty should not upset yourself. Inshallah, you will soon get better and return to the country.” His Majesty said: “With my health problems and after what the people did to me, how could I possibly return? In any case, I did everything in my power to serve my nation and now I await my fate. I have always been close to God and continue to be so. I always talk to my God but what can I do, the conversation is one way and I hear no response.” During the last days of his life, His Majesty had grown very weak. Instead of thinking about his illness, he was thinking about his country and the Iranian nation and with great emotion he would say: “We wanted to guide Iran towards the Great Civilization but the current regime will definitely take Iran towards final destruction. I fear that Iran will be dismembered.” His Majesty would say: “You know, the rate of suicide is greater in the advanced nations than those of the Third World. Take Sweden as an example. Despite having the highest standard of living it has the highest rate of suicide in the world. But in countries like Biaphra or Eritrea where people do not even have enough food to eat nobody thinks about suicide. If the Iranian people were fair and compared their situation with other countries and how Iran was 50 years ago, they would see that they were living in peace. They had it so easy that they decided to have a revolution to supposedly further improve their lives. But this was not a revolution of the Iranian people. In fact it was collective suicide on a national scale that took place at the height of prosperity.” Two days after saying these words, His Majesty passed away and joined immortality. Thanks aryamehr. Very telling and sad. Thank you for this interview. The way Iranians treated the Shah after all that he and his father did for Iranians was very tragic. Perhaps if the Shah's ministers had the wisdom to inform him of the rising problems in the country, instead of hiding them, the issues would have been addressed, preventing the revolution.